"Find Out How I Make a Seven Figure Income Using My Unique Direct Mail Strategies to Locate Highly Qualified Motivated Sellers"
And How You Can Do The Same In Your Pajamas Without Licking A Single Stamp!" When I first got started in the real estate business a few years ago, I was working in full-time sales logging thousands of miles each year because if I didn’t work, I didn’t get paid. Frankly, I was tired of the whole business. I just thought there had to be a better way to make a living. Then I discovered real estate and quickly found out the best deals were going to be made only with sellers who were truly motivated to sell. Once I decided I wanted to make a lot of money…and enjoy the good life that goes with it, I knew I needed to find a way to make it happen. And the way to that goal was to find motivated sellers who wanted and needed to sell. I Want To Help You Earn The Same Big Profits I Do! I'm sure you're skeptical. In fact I hope you are. Because that’s smart. But I urge you to read on to find out what makes my systems so special…. and why I’m willing to share my secrets with you. Hundreds of real estate investors all over America have implemented my systems. Now they have motivated sellers practically begging them to take their properties off their hands. What's their secret? What's their edge? At Last I Have Unlocked The Secrets To Getting Really Motivated Sellers Contacting You. Carve A Unique Niche Market That Other Real Estate Investors Simply Don't Know About. My special techniques are designed to identify and address a unique and virtually untapped marketplaceof motivated sellers … some of those include out-of-state owners, pre-foreclosures, burned-out landlords, hard to find owners, expired listings, estates and more!! Written and spoken in simple language, with Step-By-Step directions even a novice can follow, my unique systems take all of the guesswork out of the equation! THE TRUTH IS…Not Everything Has To Be Hard! My “Cookie Cutter” Systems Are Incredibly Easy To Implement !! I've even included all the information you’ll need to put my systems in someone else’s hands and get them to do all the work for you so you can concentrate on reaping the rewards of CLOSING THE DEALS and getting the BIG checks. How much easier can I make it? The bottom line is, almost everyone would like to find a way to make lots of money with little or no effort. What could be easier than having the truly motivated sellers contacting you first? Gone are the long and boring days of calling ads from the newspaper, or burning gas driving around looking for the same houses everyone else is driving around looking at, or burning money on classified ads hoping for the best! There is an easier way! The sellers will contact you first and when they do, let me tell you, there are some wonderful deals to be made. The more motivated the seller is, the better the deal is going to be. Simply put, it’s all about having the motivated sellers contacting you first with the pretty houses and the ugly ones. These strategies have been perfected over the last several years and several hundred properties that I have bought and sold and hundreds done by my students. This Amazing System Works Whether You Are A Novice Investor Or A Seasoned Pro. Almost everyday I get e-mails and faxes from my students sharing their success stories, and they tell me how my systems have changed their lives! As you read them, you will quickly see these are just average folks who were looking for a way to increase their business and find even more motivated sellers. · You'll learn how to locate more deals in just a couple of weeks than you will be able to process in a year. · How to find the owners of vacant, abandoned houses even when they don't want to be found. · Why YOU don't have to work hard to make this system a success. And how getting someone else to do all the work for you will make you rich!! · Learn How To Automate The Follow-Up Process, The Deal-Making Process And Make Thousands More Without Ever Leaving Your Desk. · How hundreds of students all over the country are getting houses deeded to them in beautiful neighborhoods and how you can too. · How to find and make incredible deals with the owners of out of state properties. · How to carve a niche market for yourself by finding the most highly-motivated sellers that even your competition doesn't know about. · How to locate pre-foreclosure properties your competitors don't know anything about. · How to start from scratch and complete your first deal within 45 days. These techniques are designed to identify and address a unique and virtually untapped marketplace of motivated sellers and show you how to approach these sellers in a way that will make them contact you. Stop Searching For Sellers The Hard Way!! · Implement this dummy proof, affordable and effective marketing system that will have motivated, qualified sellers contacting you. · Position yourself out in front. Enjoy having the competitive edge with sellers who not only haven't heard from your competition, they don't even know they exist. · Turn small marketing dollars into BIG profits with MINIMAL effort and HUGE results. · Have an endless stream of motivated sellers practically begging you to take their properties off their hands. · Learn how to put this system in someone else's hands so you can close the deals with the many sellers who contact you. · Pick out the marketing gems that work best for you in your area and capitalize on them for maximum profits. I've put everything I could get on CD into these two self-study programs you can use at home, at your own pace. There are four audio CDs in each set, where I walk you through every step and answer every question (that's 8 CDs altogether). The CDs come with a track list with each topic identified. This allows you to go right to the track that contains the information you are interested in, and get the information you need right away to start finding the motivated sellers and start making deals. I've also provided all of the letters for you on CD. This makes it easy for you to reproduce and use any of the letters over and over again. All you have to do is change them to reflect your personal information such as phone number, fax number, and e-mail address. This program will work with several different word processors. The audio CDs very closely follow the systems manual. This makes it easy to follow and refer back to at your leisure. They are especially handy for a quick review or to jog your memory when you are working on a particular direct mail campaign or you want to reach specific types of motivated sellers. Each direct mail campaign is covered in complete detail within it's own section in your systems manual, so you do not have to hunt all over the manual for specific directions you need. This also makes it very easy for you to give the manual to someone else to do all the work for you, giving you more time to work with the sellers. Each systems manual includes it's own intensive study guide and step-by-step directions to do each individual direct mail campaign. These systems are also loaded with many other types of marketing ideas and word-for-word scripts so you never have to wonder what to say to these motivated sellers. I've also included within these systems lots of great ways for you to easily find the lists you'll need to locate these very motivated sellers and a property evaluation sheet to help you determine the value of these properties so you can begin making offers. This is just one great way to automate the system. And … to insure that you succeed in using my systems, you will have a “coach” on call for One Full Year after you receive my systems. But only if you are able to make a decision quickly. More about that a little later. How to attract only the most motivated sellers and have them practically begging you to take their property off their hands. How to use my special Response Mechanismdesigned to get motivated sellers contacting you quickly. How to use my step-by-step marketing plan to find motivated sellers even if you haven't done your first deal yet. How to pre-screen sellers so you only deal with the ones most likely to make the best deals with you, instead of wasting your time on houses you will never be able to buy. How to Automate the Systemto get someone else doing all the work for you so you can close the deals. You'll learn how to find more deals in the first couple of weeks than you will be able to process in a year. Finding the deals is the easiest part when you use my unique systems. How to find and contact the owners of vacant, abandoned properties and how to make incredible deals on these properties. How to find and make incredible deals with burned out landlords. These can be a wonderful opportunity to purchase multi-properties. How to locate motivated sellers who need to sell and have no idea about how to solve their problem. Some of these very motivated sellers include out-of-state owners, estates, and divorce situations. How to follow up with prospective sellers so you end up buying their property when their circumstances dictate that they sell. Most real estate investors leave boatloads of money behind by not having a follow up plan in place. Telephone scripts so you'll never have to wonder what you should say to these motivated sellers. How to do mailings within specific zip code ranges in your area and refine your list to reach only the most motivated sellers within these zip codes. How to use the other 10 marketing techniques that I share with you to find motivated sellers. Typical marketing rules say that you should have between three and five marketing strategies in place in order to have the highest number of motivated sellers contacting you at any given time. How to build credibility and confidence with your sellers from their very first contact with you. A step-by-step marketing plan for you to have even more motivated sellers contacting you quickly. How to get motivated sellers calling you with houses other investors simply do not want or know how to buy. But you will! Even more low-cost techniques to attract motivated sellers to contact you … plus, all the scripts you'll need to pre-screen sellers so you end up dealing with only the most highly motivated of the group. How to locate motivated sellers who will deed you excellent homes in lovely neighborhoods. How to approach and get Realtors to supply you with more qualified leads than you can handle without having to pay huge commissions. How to locate the owners of and purchase pre-foreclosures before other investors know about them. How to Call On Ads, what to say, who to call and how to get someone else doing all the work for you so all you have to do is deal with sellers who really want to sell. I have even included the telephone scripts so the sellers are pre-screened for you. How to find your personal dream home in a lovely area with no cash out of pocket and no credit. Purchase a beautiful home for yourself and your family for way under it's market value and make all your friends jealous. How to use Attorneys to find you great deals on distressed properties no one else knows about. This is an excellent lead generation technique to find properties that other investors simply don't know about without any other work on your part except for the initial contact with the attorney. How to use your current tenants as bird dogs and motivate them to continuously find you great leads on properties you can purchase and get your rents paid on time. How to find and work with the owners of properties with no mortgages and get really creative financing on these excellent properties in great neighborhoods. How to target other niche markets that other investors just don't even think about and make great deals on great houses there is absolutely no competition for. Learn how to use 14 additional marketing techniques that are some of my personal favorites to build your lead base and let even more sellers know that you are in the business of buying houses and create even more revenue in the process. How to use Wholesale Buyers to bird dog for you, build your lead base and make you even more money by purchasing the properties from you after you get them under contract. These are all the marketing techniques that I personally use to generate more leads than I can process. In the last few years, I have bought and sold over 200 properties using these methods on a daily basis. So I know they work. And according to students who are using my systems all over the country, they will work no matter where you live. 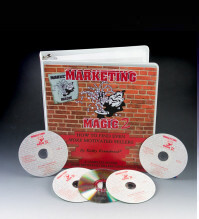 If you want to have all the motivated sellers you'll ever need contacting you, then these Marketing Magic systems are for you! Your business can't survive without sellers, and personally … I only like the ones who are motivated to sell. Recognize the difference between a motivated seller and a non-motivated seller. Quickly end a conversation with a non-motivated seller. Get all the information you need to determine whether or not there is a deal to be made. Leave the lines of communication open with semi-motivated sellers so you can follow up and do a deal at a later date when the seller becomes more motivated. Listen to the scripts over and over until you become comfortable with the words you need to say to sellers. Make the deal on the phone before you ever go see the property. Work with all kinds of sellers in all kinds of situations. These are the telephone scripts I use everyday to talk to all kinds of sellers so I know they work. I wanted to share this special product with you, my students, as a way to help you get even more deals done and jump start your real estate business! I have even included a copy of my personal 24-hour recorded message, both on CD and transcribed. You will also receive an important bonus. My personal help!! But only if you act now!! This is your personal assurance of success!! You'll receive One Full Year of personal guidance and support from ME! I'll answer whatever questions you may have about the marketing techniques you are using via e-mail or fax. You must act quickly since I can only work with a limited number of students at any given time. You'll also get all the guidance and support you need to get you started on your way to building a successful marketing campaign. It's advice you can trust since I have spent the time perfecting these systems, which I use every day, for your use. Imagine the value this one service can add to your business!! This guidance and support has meant thousands of additional dollars to new students by helping them perfect their own marketing strategies. At normal consulting fees, this service is valued at $3,000.00 by itself, but it's yours at NO ADDITIONAL CHARGE if you act now. Now I know you may think that $1,297.00 is a lot to spend on training materials. The truth is you're going to spend this amount whether you purchase my systems or not by mailing the wrong letter to the wrong lists, not getting your mail opened and read and missing out on thousands of dollars of additional income from potentially BIG deals!! Here is an example of just some of my most recent deals. Purchased home for $45,000. Did $7,000 in rehab and sold 60 days later for $115,900. After Costs Net - $61,000. Put rehab home under contract for $650,000. ARV $1,200,000. Sold for $999,900. After Costs Net - $190,000. Purchased home for $45,000. Did $2,000 in rehab. ARV $87,000. Cash flowing at $5,000 per month. That's $366,000 On Just 4 Deals, Because I Knew How To Find These Motivated Sellers. You can do nothing at all, after all that's the easy thing to do, right?? And you'll still have your $1,297.00 … or will you?? Most likely, if you're active in the business at all, you'll still be squandering your money wondering why you can't get any motivated sellers contacting you and why you aren't buying any houses. You'll lose many times the amount of these systems in lost opportunities. Your other choice would be to try to imitate my systems without having all the tools available to help you. I know from personal experience you will make many mistakes and it will cost you a great deal more than the price of my systems. I have perfected these systems to take all of the guess-work out of the equation for you, and it has taken time and mistakes to perfect the systems for your use. So why try to re-invent the wheel when there's a proven system already in place for you to implement?? Now I know my systems may not be for everyone, and if you're not seriously ready to take your business to the next level and have more motivated sellers contacting you than you can handle, then maybe my Marketing Magic systems aren't for you! But personally, I think if you've read this far, you're ready to take your business to new levels! So, if you are able to make a decision today, and take your business to another level, then make the best choice and order these two systems today and put the tools I've created to work for you! Use the fax, e-mail and phone support to your advantage and get that head start you need in your business and start getting motivated sellers contacting you immediately! If you'll do your part, I'll do mine to help you to create more deals than you can handle. When you make that choice, the price becomes insignificant compared to the huge numbers of motivated sellers you can have practically begging you to buy their homes and start making money!! Just fill out the order form below and get your systems today. You have everything to gain and nothing to lose! I only want to work with serious, excited, happy customers, so here is my iron clad, no risk guarantee to take away any remaining doubts you may have. Order my complete systems with the bonus support! Try it for 10 days. If you're not absolutely convinced these systems are everything I said they were, or if you feel for any reason they do not live up to what I promised, or you simply change your mind, please return them for a prompt and courteous refund of 100% of the purchase price, no questions asked. Well I've made my case in the best way I know how. You are either in or out!! If you're in, order right now for quickest delivery!! There's absolutely no risk, absolutely no way to lose. P.S. Don't forget. Order today to receive one full year of free e-mail and fax support, A $3000.00 Value! !